Drosophila virilis, photographed by Darren J. Obbard. 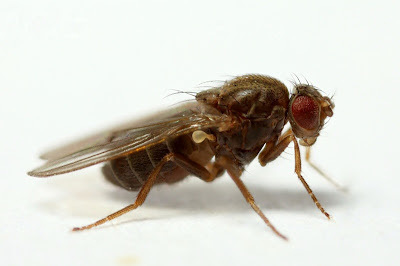 Drosophila subgenus Drosophila is one of the major recognised subdivisions of the large genus Drosophila. Phylogenetic analysis suggests that some taxa recognised as separate genera are nested within this subgenus (Robe et al. 2005). Characters (from Singh et al. 2004): Gena often broad; second oral bristle large; prescutellar acrostichals not, or barely, enlarged; propleural bristle absent; apical bands on anterior abdominal tergites, when present, usually interrupted in midline; usually rather large species. [CE79] Coyne, J. A., W. F. Eanes, J. A. M. Ramshaw & R. K. Koehn. 1979. Electrophoretic heterogeneity of α-glycerophosphate dehydrogenase among many species of Drosophila. Systematic Zoology 28 (2): 164-175. [RV05] Robe, L. J., V. L. S. Valente, M. Budnik & E. L. S. Loreto. 2005. Molecular phylogeny of the subgenus Drosophila (Diptera, Drosophilidae) with an emphasis on Neotropical species and groups: a nuclear versus mitochondrial gene approach. Molecular Phylogenetics and Evolution 36: 623-640. [SDF04] Singh, B. K., S. Dash & R. S. Fartyal. 2004. Revision of the species of the subgenus Drosophila (Drosophila) of the Kumaon region, India, with the description of eight new species. Senckenbergiana Biologica 83 (2): 163-176.